The small festival will also welcome Jake Bugg, We Are Scientists and Everything Everything to this year’s event. The UK’s longest running small festival Truck has announced its first wave of artists for 2018 to mark its 21st birthday. The three headliners announced are Peace for Thursday, Friendly Fires for Friday and George Ezra for Saturday. Ezra has admitted that playing Truck has “been on my bucket list for a long time”. 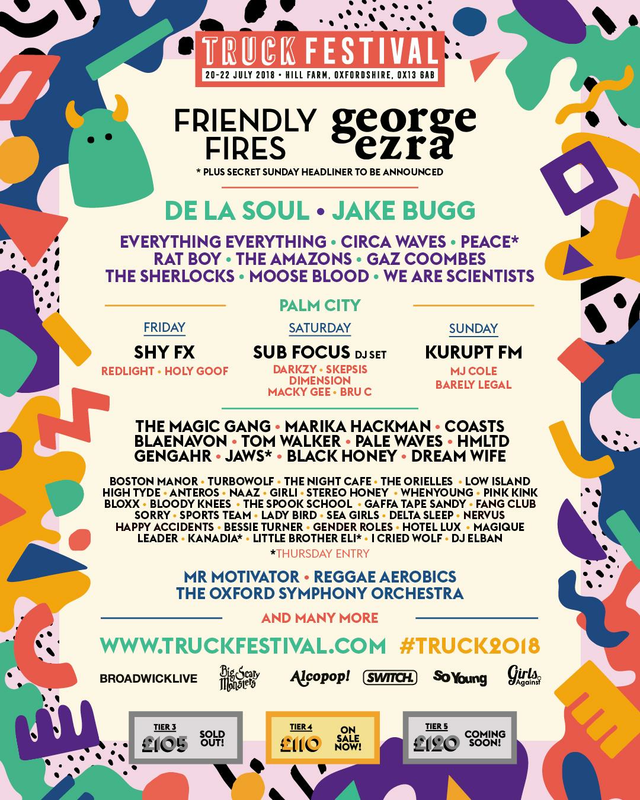 Also added to the bill are De La Soul, Jake Bugg, Everything Everything, Circa Waves, The Amazons, Rat Boy, Gaz Coombes, The Sherlocsk, Moose Blood, We Are Scientists, Jaws and Radio X ones to watch for 2018, Pale Waves. The festival, which formed two decades ago in 1998, will this year take place from 19 – 22 July at Hill Farm in Steventon, Oxfordshire. 2018 will also be the first time that the festival has added a Thursday with the festival taking place over four days in 2018.